Republican Dan Patrick became Texas Lt. Gov. in 2015. Dan Patrick was born in Maryland in 1950. Patrick's pre-political career began as a television broadcaster in 1977 in Scranton, PA. Two years later would become a sports broadcaster with KHOU-TV in Houston. After leaving sports broadcasting, Patrick filed for bankruptcy over an unsuccessful chain of sports bars. Patrick eventually began hosting a conservative talk show in Houston, and in 2006 he purchased a Houston area radio station. Patrick was elected to the Texas Senate in 2006. His first session was highlighted by verbal altercations with other Senators in public and in private. He made a last-minute attempt to cut $3 billion from the state budget during the final debate, a move that irritated lawmakers who argued Patrick had not bothered to offer these ideas for cuts during the months of work on the budget leading up to the final vote. His next sessions saw a less confrontational Patrick focused on passing conservative legislation like his abortion sonogram bill, which requires women seeking an abortion to view a sonogram of the fetus and hear the heartbeat. Patrick ran against and defeated then-Lt. Gov. David Dewhurst in the 2014 GOP Primary. He then defeated Sen. Leticia Van de Putte in November of 2014. Patrick had campaigned on eliminating the Senate's traditional two-thirds rule, which required two-thirds of Senators to agree to bring a bill up for a vote. On his second day in office the Senate voted to change the threshold to three-fifths. After the vote, Patrick said the rule change will help him, "deliver a conservative agenda." The new Senate rules also cut the number of Senate committees from 18 to 14. Patrick made good on another campaign promise by only giving two Democrats committee chairmanships. Patrick says his goals for the 84th Legislative session include school vouchers, border security and transportation. Announced Tuesday afternoon, the demotion caps a weekend spat between Seliger, an Amarillo Republican first elected to the Senate in 2004, and Patrick, who have found themselves at odds with one another after Seliger voted against two of the lieutenant governor’s priorities in 2017. Texas Lt. Gov. Dan Patrick on Thursday challenged Fox News contributor Geraldo Rivera to a debate over immigration. Lt. Gov. Dan Patrick is urging the Teacher Retirement System not to raise health care premiums for retired teachers, arguing that state lawmakers should take on the burden of increased costs. Two days before Christmas, on the east side of San Antonio, police made a discovery – one that had echoes of earlier incidents involving undocumented immigrants being smuggled into Texas and suffocating in tractor trailers. This time there were no deaths. The driver of the truck was charged under a state human smuggling law, and the 12 people in the trailer were questioned and released. Now Lt. Gov. Dan Patrick has asked Attorney General Ken Paxton to investigate whether San Antonio police may have violated Texas law. Just four days before the start of the special legislative session, Lt. Gov. Dan Patrick has spelled out plans to give longevity bonuses to public school teachers, and boost benefits for retired teachers. At the height of the battle over Houston’s Equal Rights Ordinance, Mayor Annise Parker subpoenaed the sermons of five pastors leading the fight to repeal the measure. Even though HERO is now history, Lt. Gov. Dan Patrick is determined to keep this from happening again. From the Texas Tribune: Lt. Gov. Dan Patrick is taking an official role with the campaign of Republican presidential nominee Donald Trump, serving as his Texas state chairman. Texas Lt. Gov. 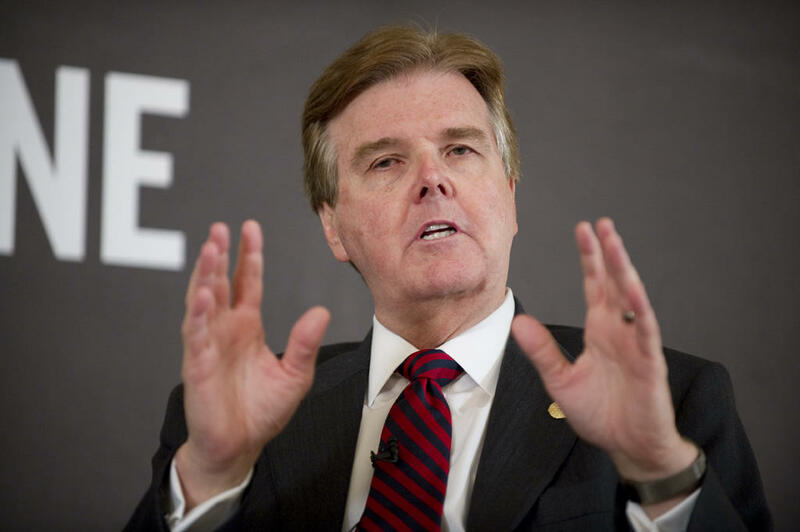 Dan Patrick joined a handful of other Texas Republican officials Friday in blaming former Black Lives Matter protests for the shooting in Dallas Thursday night that left at least five police officers dead. "I do blame people on social media with their hatred towards police," Patrick said during an interview on Fox News on Friday. He added that, despite the "peaceful" nature of last nights protests, he blames former Black Lives Matter events for the incident. Parents of transgender children here in Texas spoke up on Tuesday against Lt. Gov. Dan Patrick and Attorney General Ken Paxton. Both officials are leading the state’s opposition to a new directive from the Obama administration that says students need to be allowed to use the bathroom that corresponds with their gender identity. The parents say state leaders are creating a hostile environment for their children. From the Texas Tribune: Texas, joined by 10 other states, filed a lawsuit Wednesday to stop a federal directive instructing school districts to let transgender students use the bathroom that corresponds with their gender identity, Attorney General Ken Paxton announced Wednesday. From the Texas Tribune: Will public schools really lose federal education funding if they refuse to comply with a new Obama administration directive regarding transgender students? That's the basic query posed by top lawyers from Texas, Oklahoma and West Virginia in a letter sent Tuesday to the U.S. Justice and Education departments seeking clarification on the directive, which advises the nation's public schools to allow transgender students to use the bathrooms that match their gender identity. Updated at 5:30 p.m. ET. 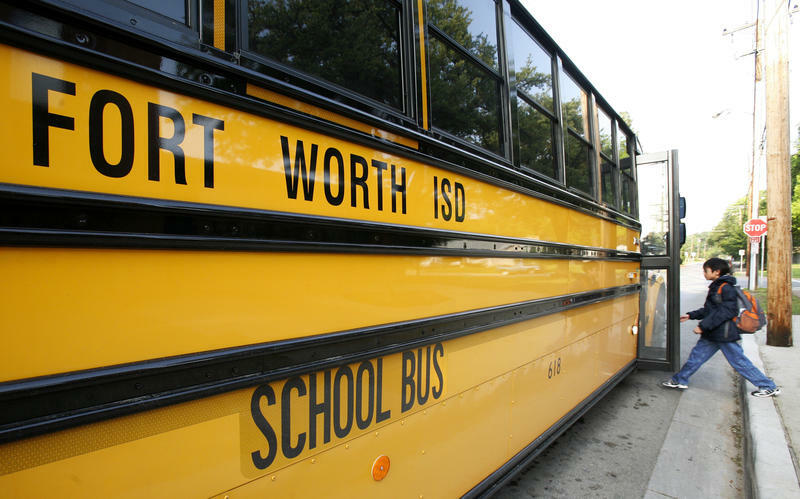 Texas' lieutenant governor is calling for the resignation of the Fort Worth Independent School District superintendent over guidelines intended to support transgender students. Texas made plenty of national headlines in the New Year, as it became the largest state in the U.S. to allow citizens to openly carry handguns. On Sunday, Lt. Gov. Dan Patrick went on national television to defend the new law, and point towards further loosening of gun regulations.